We’re your go-to shop for bulk Concord Confections candy, the makers of delightful classics like Cry Baby sour candy, Razzles, and Nik-l-Nips. These fun and colorful candies have been childhood favorites for decades; who doesn’t remember the mouthwatering pucker of biting into a Cry Baby Sour or the enjoyment of purchasing some baseball-themed Home Run gumballs? 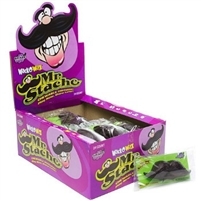 We even supply Concord Confections’ infamous and hilarious wax lips. Whether you’re supplying a store with fun treats, have a school or summer camp to run, or simply want to introduce your family to some old staples, our bulk Cry Baby Candy and other varieties of bulk Concord Confections candy is priced to please. We’re a family-run business with a dedication to our customers, so we’re always out to provide you with the best deals and discounts on your favorites. Order today and receive free shipping on purchases of $150 or more! 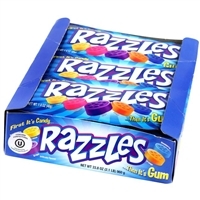 Razzles are small bits of yummy candy that once chewed turn into tasty gum! 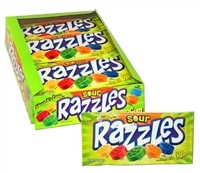 Available in Original, Sour and Tropical flavors. Enjoy all 3!